I stuck a post up on social media a few weeks ago after watching this awesome TEDx talk by Ted Dintersmith at TEDx Fargo. Have a watch and then you will know what I am rambling on about. Well after posting the following on social I realised I had more to say on the matter, so here it is! Basically, this video got me thinking about the current model of education within the fitness industry. More specifically the education of fitness instructors, personal trainers and other fitness professionals. For a good while, I have been involved in the process of educating and certifying personal trainers in a range of different qualifications. I like to think that I have provided a quality learning experience for those who have been on courses I have taught or been involved with managing/developing. This is something I take both great pride in and am very serious about in terms of raising the standards to help produce fitness professional of the future. Now without getting too boring but courses are designed to a set of occupational standards that are set for specific job roles based on consultation with industry. These are basically a list of knowledge, skills and behaviours that a specific job role should possess set by our industry as a whole rather than specific training providers. These are then used by awarding bodies to create a syllabus that then dictates the content of courses. So in terms of overarching content, all courses should be the same (roughly) in terms of content. Now I am not saying that the quality is always the same but that is a subject for another day. 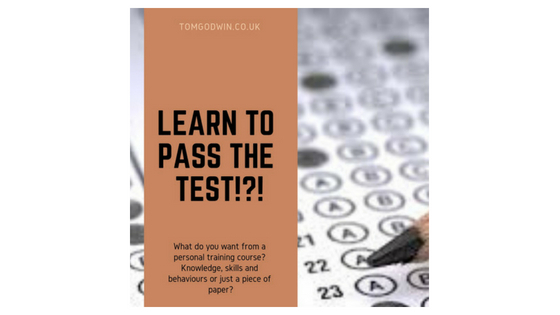 One of my concerns in many situations is that some training providers train their learners to pass the test, whatever assessment method that may be. Rather than the point of education is giving learners a chance to develop skills, knowledge and behaviours with a test being a chance to showcase some of the aspects of the learning journey they have been on. Why is this important? Well if we are producing a load of trainers that learn to pass a test, then how can we have a responsive team in our gyms? A team that is capable of taking that knowledge and applying it to the varied and sometimes complex situations they come across. Particularly if this is a different situation to the one they were assessed under. So if you are a prospective fitness professional, look for a course that will give you the knowledge, skills and behaviours to be an amazing fitness professional rather than just a quick course that gives you a piece of paper… Make sure you chose your provider wisely. There is a link between the shorter courses that churn out trainers and trainers that wonder why they can not make the fitness industry work for them. I see the temptation to do a shorter and generally cheaper course and get started in a career that might change your life. You just want to get started but I would give some serious thought to the longevity of your career. Take the time to enjoy the learning process and truly absorb the content and become an expert in your field. If you are unsure what you want from a personal training course then reach out to me on social media always happy to offer advice. Don’t just learn to pass the test, be an expert in your field, be obsessed by your subject and never stop learning!